Looking for a real multicultural experience? Head to Chad in north-central Africa where 8.6 million residents belong to more than 100 ethnic groups or to Togo, home to 37 tribal groups that speak one of 39 languages and share little in the way of a common culture or history. But if you find a kaleidoscope of cultures distracting, then consider a visit to Argentina, Haiti or the isolated Comoros islands off the southeast coast of Africa. They rank among the least culturally diverse countries in the world. This multicultural map of the world is based on an analysis of data reported in a new study of cultural diversity and economic development by researcher Erkan Gören of the University of Oldenberg in Germany. 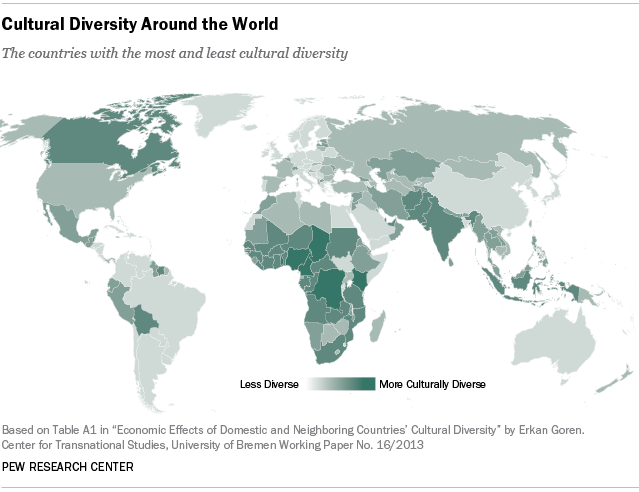 In his paper, Goren measured the amount of cultural diversity in each of more than 180 countries. To arrive at his estimates, he combined data on ethnicity and race with a measure based on the similarity of languages spoken by major ethnic or racial groups. “The hypothesis is that groups speaking the same or highly related languages should also have similar cultural values,” said Goren in an email. Together he used his language and ethnicity measures to compute a cultural diversity score for each country that ranged from 0 to 1, with larger scores indicating more diversity and smaller values representing less. The usual suspects lead the list of culturally diverse countries: Chad, Cameroon, Nigeria, Togo and the Democratic Republic of the Congo. These and other African countries typically rank high on any diversity index because of their multitude of tribal groups and languages. The only western country to break into the top 20 most diverse is Canada. The United States ranks near the middle, slightly more diverse than Russia but slightly less diverse than Spain. Argentina, the Comoros, Haiti, the Dominican Republic, Rwanda and Uruguay rank as the world’s least diverse countries. Argentina may be a surprise, what with all those Germans and Italians pouring into the country after one world war or the other. But Spanish is nearly universally spoken in Argentina, 97% of the country is white and more than nine-in-ten Argentines are at least nominally Roman Catholic, according to the CIA’s World Factbook. The presence of Rwanda at the bottom of the list likely is, in part, a grim reminder of the mass slaughter of Tutsi by the dominant Hutu majority in 1994 in what came to be known as the Rwandan Genocide. A caution: Cultural diversity is a different concept than ethnic diversity. As a result, a map of the world reflecting ethnic diversity looks somewhat different than the one based on Goren’s cultural diversity measure that combines language and ethnicity profiles of a country. The Harvard Institute of Economic Research developed a map similar to the on posted above based on Goren’s findings. (See it here). A comparison of the Harvard and Goren maps show that the most diverse countries in the world are found in Africa. Both maps also suggest that the United States falls near the middle, while Canada and Mexico are more diverse than the US. The largest disagreements between the two analyses occur in South America. The Harvard group places Brazil slightly above the upper-middle range of its diversity scale, in part because of its large mixed-race population. However, Goren ranks Brazil as one of the least diverse countries in the world, in large part because virtually all Brazilians speak Portuguese regardless of their race or ethnic background.